Comment: Book in great condition with tons of life left! Book will have some amount of writing and/or highlights, along with noticeable wear on the cover and/or pages. NO water damage, binding in tight, excellent condition. No CDs or access codes will be included. Missing dust jacket. Fulfilled by Amazon - use Amazon Prime for 2-day Shipping! There are over one million children in the US who suffer from Obsessive-Compulsive Disorder. These children often have uncontrollable worries and engage in seemingly senseless rituals. Parents and school professionals often feel helpless and frustrated as they struggle to understand and help the child stop the bizarre doubts and habits that take over the child's mind and life. Now, there is hope and help.Dr. Aureen Wagner brings you the latest scientific advances in the treatment of this beguiling disorder along with her many years of experience in treating children and teenagers. Using the metaphor of the Worry Hill, for which she has received international recognition, Dr. Wagner presents a powerful step-by-step approach that countless children have used successfully to triumph over OCD. 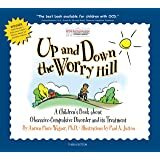 Her skill, compassion and expert guidance will provide new hope, energy and resolve to help children and their caregivers conquer OCD.Designed to be used alone or with the children's integrated companion book: Up and Down the Worry Hill. This book contains information on child anxiety, anxiety in children, child OCD, obsessive compulsive in children, OCD in children, anxious children, worried child and anxious child. DR. AUREEN PINTO WAGNER is Director of The Anxiety Wellness Center in Cary, NC, Adjunct Associate Professor at the University of North Carolina at Chapel Hill, and member of the Scientific Advisory Board of the International OCD Foundation. Dr. Wagner is a clinical child psychologist, anxiety treatment expert and sought-after international speaker who is recognized for her unique Worry Hill(R) treatment approach. She is the author of several highly acclaimed books on anxiety and its treatment. 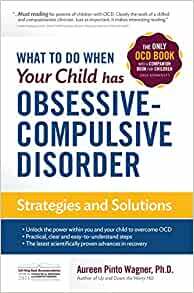 This book really helped me when I first learned my daughter had OCD. It's packed with great information and really helped me to know I wasn't alone and there is help for her. This is written by a child psychiatrist who specializes in children with high anxiety and OCD. You won't be sorry you purchased this. I go back to it time and again. I even emailed the Dr. and she emailed me back with further information. This book was really helpful for my paper that I had to do for my class Behavior Support that taking at Northampton Community College. My son has aspergers and OCD. The OCD component is very difficult to manage. This book has helpful information on how to deal with this mental health disorder . good information---although a long read..too bad it was not avail on audito, which would have meant I could have gotten through it quicker. Very user friendly book for the non specialist parent. Answers all possible questions. Well structured, eye-friendly layout, simple language easy to understand and use to help your child. You really understand nature of illness and ways to help. I absolutely recommend it to everyone in need, even for those that English is not a native language, like me. It is a step by step. easy to follow guide for any parent trying to help themselves and their child.